Ankle problems seem to plague many top professional athletes this year. New York Yankees shortstop Derek Jeter started his season with a broken ankle, and the injury has stayed with him, causing him to end the season with continued pain. The ankle is a complex part of our foot, with many components that work together to allow you to walk, run and jump. When it is injured, long-term problems can arise and lead to persistent, chronic ankle pain. Avoid this situation by steering clear of ankle problems in the first place! A small amount of attention and prevention goes a long way when it comes to keeping your feet and ankles healthy, especially if you are an athlete or active on a regular basis. Strengthening the muscles around your ankle and improving flexibility both play a role in preventing an injury such as a sprain. Start with the familiar calf raise. Stand with your feet shoulder width apart and knees straight. Lift your heels up off the floor, hold for a few seconds and lower. Repeat this several times, and then take it up a notch by standing on the edge of a stair, allowing heels to lower before being raised up. You can then progress to one foot at a time. A second prevention exercise involves the use of a resistance band. Wrap one end around the foot to be worked on and the other to a sturdy object on the outside of the leg. Try to point your toes across to the opposite leg and release. Repeat several times and then tie the band to another object on the other side of your body and point your toes in the other direction. Exercises like these are easy and can be done while watching your favorite show. They do make a difference and will be worth your time! 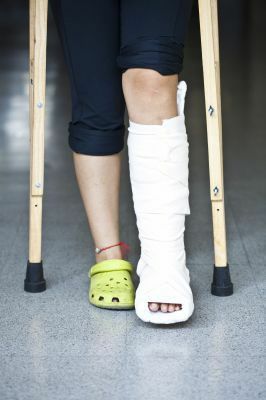 If you have had an ankle injury that is not healing well, or are experiencing chronic pain, please allow us to step in and help. Dr. Harvey Danciger can pinpoint the root of your pain and provide the exact treatment you need to get back on your feet. Call our office in Palm Desert, CA at (760) 568-0108 to make an appointment today.